The company has conducted an employee satisfaction (ES) survey since fiscal 2003. This survey is used both to gauge current ES and to consider any measures to be undertaken in response to challenges. An accommodating work environment is being developed by the identification of challenges and by the implementation of responses to them. The company supports employee career development by having specialist career advisors who can offer suitable advice to employees. Such advice promotes the self-resolution of issues by employees themselves. These activities are undertaken to both improve human capital of every employee, and also to respond to the wide range of consultations requested by employees regarding career-structuring issues. Utilizing the company's intranet, the “president's office network” has been established as an initiative that connects directly the president and employees. The network is operated so that the management vision can be shared throughout the entire company. It can also pass along messages and official speeches made by the president on special occasions such as on anniversaries of the company's founding, etc. This initiative provides interactive communication in that employees are also able to convey to the president their questions and concerns regarding day-to-day operations. The feedback that the president's responses generate can also be shared with the entire company, etc. ”Converse with Executives“ gives top management a genuine opportunity to listen to employee views. Within this framework, executives visit both head office departments and branch offices nationwide. In addition to the executives being able to share with employees the background and views associated with various business challenges, the framework also allows management to directly field employee questions and opinions. Internal communications are invigorated through such direct discussions, and this framework also works to create an organization brimming with a sense of unity. The “My Total Life Plan” framework aims to improve activity and proposal skills by sharing throughout the entire company both favorable examples of consulting undertaken by Total Life Plan Designers and favorable examples of other service activities. By sharing throughout the entire company positive sales examples that feature consulting in accordance with the Total Life Plans of individual customers, we are working to cultivate many Total Life Plan Designers who can both view consulting proposals from a customer's perspective and win over their trust. We have established the Workstyle Reform MVP Commendation system to promote "Work Smart" workstyle reforms among all employees and organizations from both a top-down and bottom-up approach. Action plans are devised on a departmental basis and pursued by all employees throughout the year. The commendation system provides an avenue for employees to share success stories about their efforts. 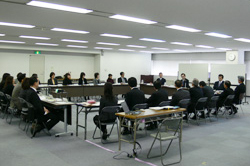 The Dai-ichi Life Labour Union employs a union shop system whereby both in-house staff and sales representatives are union members. There are some 52,000 people (as of April 1, 2018) to whom the conditions of union membership apply. The company and union engage in an active exchange of opinions via discussions held in various committees to both realize a wealthier and more cheerful lifestyle for union members, and so as to create a satisfying and positive workplace for them.